Jones overcame doubts about his light-weight stature and lack of bulk to become one of New Zealand's greatest locks and top lineout exponents. He made his debut for North Auckland as a 21-year-old in 1988 and won his first cap for the All Blacks against Scotland in 1990, marking his international bow with a try. From then on Jones was virtually an automatic selection for the All Blacks and played central roles in their 1991 and 1995 Rugby World Cup campaigns. 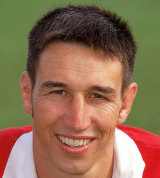 From 1992 Jones formed a quality combination with Robin Brooke in the All Blacks' engine room. The pair were instrumental as the All Blacks won the inaugural Tri-Nations tournament and became the first New Zealand team to win a series in South Africa in 1996. After falling out of favour at international level in 1998 he was recalled to the All Blacks squad for the 1999 tournament. The final of his 105 appearances for New Zealand came in the quarter-final defeat of Scotland. At club level Jones joined North Harbour from North Auckland and later represented the Chiefs in the Super Rugby competition.